Notice to Sway Fans: Sway vehicles are not currently available to purchase anywhere in the world, and can only be reserved through this website. Any other website purporting to offer a Sway vehicle for sale is either offering an unauthorized and potentially dangerous knockoff, or is a complete scam. Sway Motorsports takes no responsibility for orders placed or money paid through any such unauthorized and unaffiliated website. It’s about smiling the whole way! Powered by a high quality Lithium Ion battery pack for superior performance and longevity. Are you a dealer and interested in Sway? Are you interested in becoming a fleet customer? Would you like to stay updated as we near production? 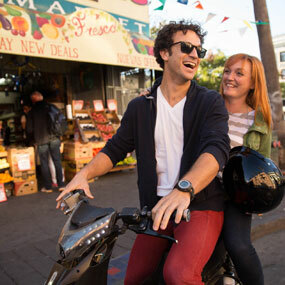 Sway is a comfortable fit and easy ride for anyone, woman or man, who can ride a standard-sized motor scooter. An early prototype was tested in a parking lot by founder Joe Wilcox’s mother–who is 5’2” and was 60 at the time! 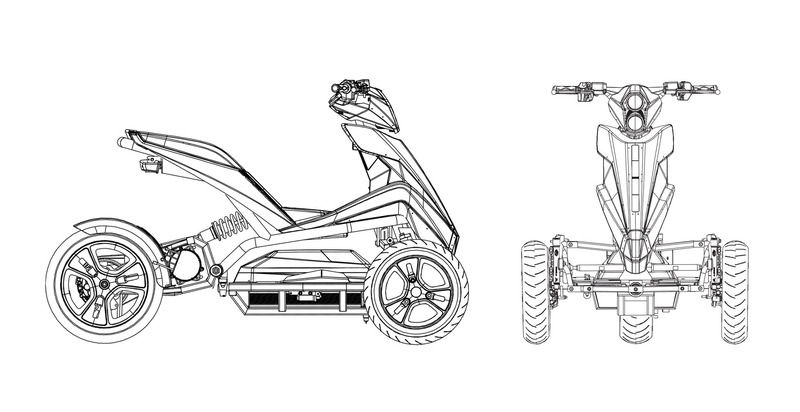 How is Sway different from other three-wheeled motorcycles? 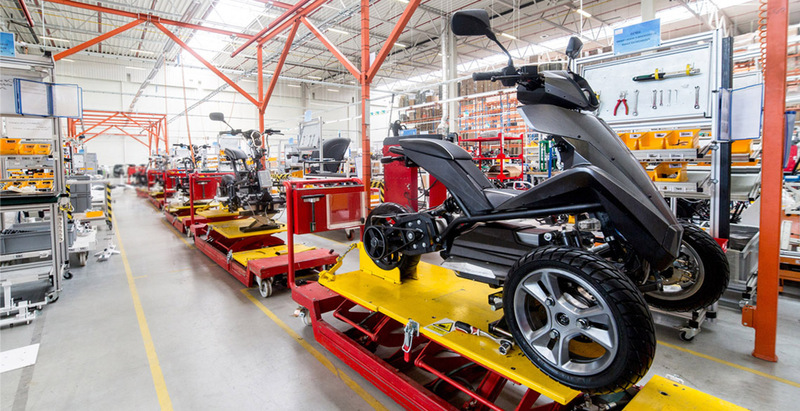 On a Sway, riders have direct control of vehicle tilt with their legs, through the patented linkage design. This makes riding a Sway a completely different experience from riding a motorcycle – or any other three-wheel design on the market. Sway can turn more tightly than a motorcycle, and riders don’t have to balance the vehicle or put their feet down at a stop. All this along with Sway’s slightly wider footprint means that Sway is also more stable in low-traction conditions such as loose gravel, mud or ice. I’m seeing ads for Sway for $150 or less! Is this real or too good to be true? Alas, these ads are fake. Sway will come with state-of-the-art lithium-ion batteries and high-end components for years of durable use, so there is no way we could sell them for so little. As we mention at the top of our page, Sway vehicles are not currently available to purchase anywhere in the world, and can only be reserved through this website. Any other website purporting to offer a Sway vehicle for sale is either offering an unauthorized and potentially dangerous knockoff, or is a complete scam. Sway Motorsports takes no responsibility for orders placed or money paid through any such unauthorized and unaffiliated website. What kind of license do I need to ride one? 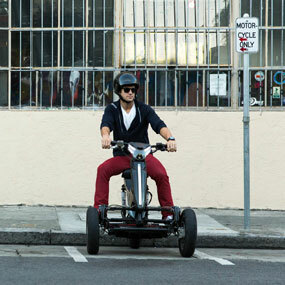 In California you can ride Sway with just a driver’s license! 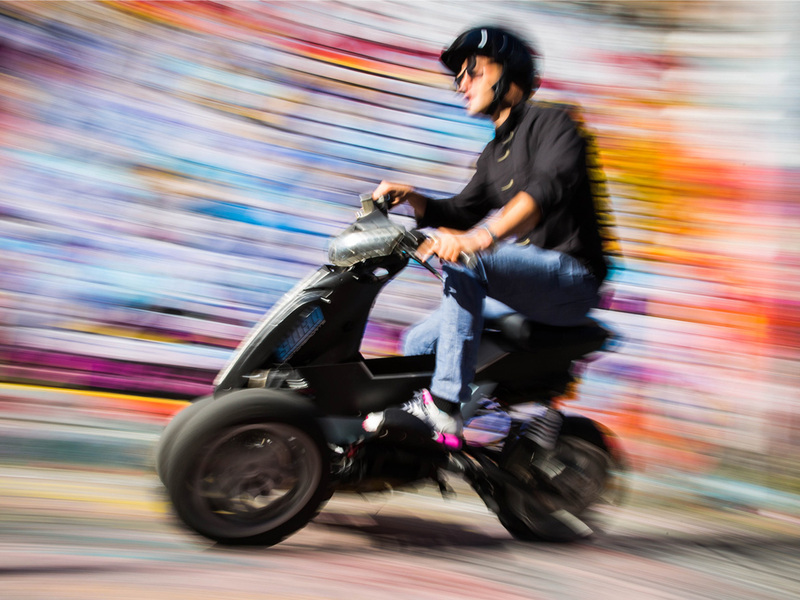 Since license requirements will vary by municipality, we recommend checking your state laws regarding three-wheeled electric motorcycles before reserving your Sway. How many cc’s is Sway’s engine? We’re electric, so the motor is not measured in cc’s. The power of electric motors is measured in watts (W). Sway Lithium has a 6 kilowatt (kW) motor, which puts out roughly 8 horsepower. It’s around the power of a 125cc gas engine, and means Sway Lithium is categorized as a Motorcycle. How does the charging work? Does it come with a charging station? Does it work with existing car chargers in parking lots? How do you set up a charger at home? The Sway charger works with both 110v household current and 240v. Sway will come standard with an onboard 110v plug for wall charging, and there will be an upgrade option for the J1772 car charger plug that will work at standard EV charging stations. A home charging unit for charging the J1772 is available, and requires 240v current. Much like a gas engine, this will depend on how you drive. If you are accelerating hard the whole time or going up steep hills, you will get fewer miles per charge. At 30 mph, the charge can last for 40 miles on Sway Lithium. Will Sway be available in Canada/Europe/Asia? We are making Sway street legal for Europe, North America and Asia. It will be distributed in the U.S. initially, but we plan to expand to other markets. When will Sway be available to test drive? Sway is available to test drive in the Bay Area right now. If you would like a test ride, contact us at info@swaymotorsports.com and we can arrange it. If you are elsewhere in California, contact us for information on when we will be in your area. I’m a dealer and I’d love to distribute Sway. Interested dealers can sign up for our dealer’s mailing list, and we will contact you with details as they become available.